Dan Lyons has a post over on ReadWrite facilitating a classic Mark Cuban rant. Cuban is pissed about the Facebook Promote fees for the Dallas Mavericks Facebook page – he was asked for $3,000 to reach 1 million people who’ve already Liked the page. As an aside, I checked the promote fees on my own FB account. It’s a flat $50 and I have 350,000 subscribers. 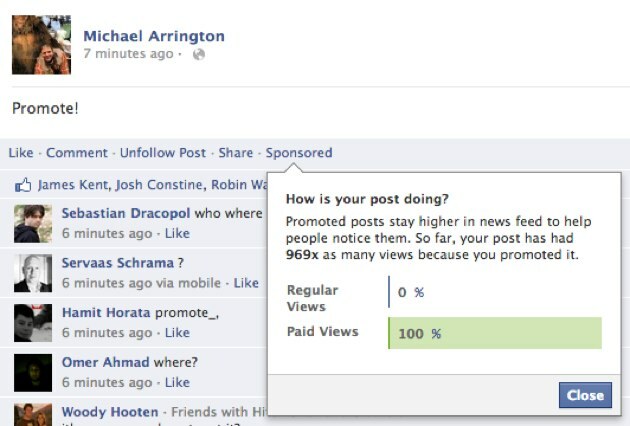 I promoted a test post – I like how it shows me how many paid (100%) v. unpaid (0%) views I have so far. Since Facebook is in control of both types of views it isn’t all that meaningful. Still, I wouldn’t feel like such a chump if I saw at least a few unpaid views. Cuban’s right, this has the appearance of shady. What I’m wondering is if Lyons got the quote wrong. Cuban doesn’t actually say he wouldn’t buy Facebook stock, he just says “I haven’t bought and…” and Lyons put that bold header on top of the quote saying “I Wouldn’t Buy Facebook Stock.” Maybe Cuban was saying he hasn’t bought a promoted post. Disclosure: I personally own Facebook stock, and CrunchFund has shares in Facebook. See my full disclosure schedule here.